Preserve your wedding dress for generations to come with our Wedding Dress Aftercare Package. 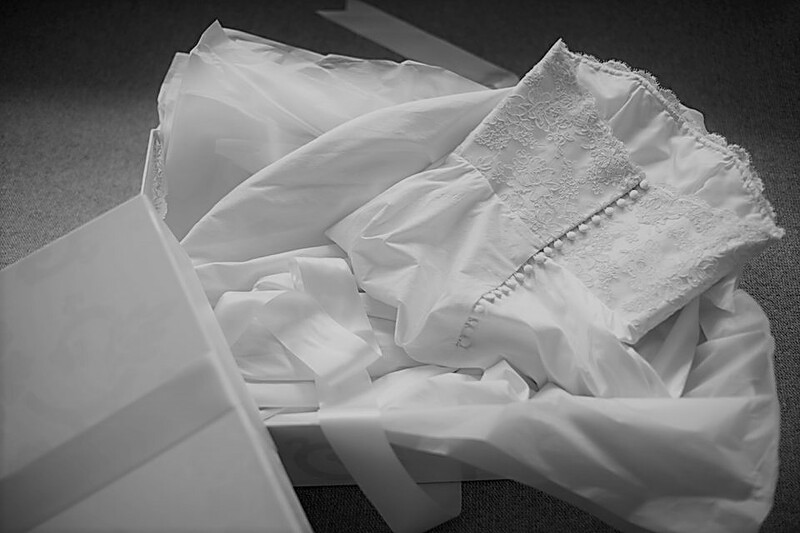 Your dress will be expertly cleaned and repaired, before being carefully packaged in one of our specially designed wedding dress boxes or bags, that creates the perfect environment for your dress to breathe over time. *a additional €50 fee is charged for silk wedding dresses or heavily beaded. Silk wedding dresses require much gentler cleaning as effectively cleaning silk is complex. We use a variety of tailored methods on silk gowns depending on the material composition and the nature of the staining to achieve the best results. Please check the care label in your dress if you are unsure what fabric your dress is made from. Cleaning, Repairs, Packing and a specialise wedding dress storage box are all included in the package. We will clean and pack your underskirt, veil and any other keepsake or accessory that you would like kept in with your dress too, free of charge. Feel free to pop in any time with your gown for the Aftercare Package, you don’t need an appointment to book it in. If you would like to have your wedding dress cleaned, repaired & packed by us, but are not local to wicklow, please ask about our couriered service.